For Social Media Ethics class, we were asked to compare dark patterns, which are designs which are put together in order to trick users into clicking on something (often to sign up for something they don’t want). 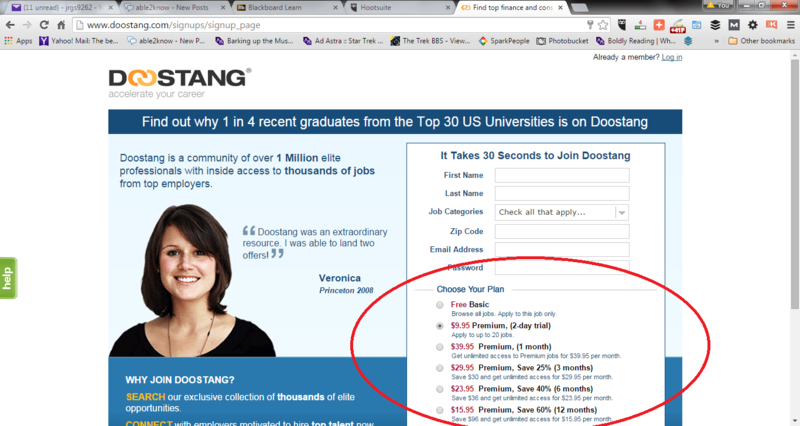 Doostang is a rather unfortunately-named jobs site, claiming to have top financial and consulting jobs. Attempt to apply for a job through them, however, and you’re passed to a sign-up screen. Fair enough, a lot of jobs sites require an account. But this one’s just a little bit different. Instead of defaulting to selecting the free sign-up, or not selecting any of the radio buttons at all, Doostang defaults to signing its potential customers up for a $9.95 “Premium” 2-day trial. Complaint: I never agreed to automatic renewal or recurring payments. As can be seen in my usage history, I did not know I had a membership to this site, and never used it. At no time did I authorize recurring payments. Desired Settlement: Please refund all monies taken after the initial payment. Please do not make me take additional action. Business Response: Doostang is very clear in stating that all memberships are automatically renewed unless canceled. Members may cancel their subscriptions at anytime. This is one of Dark Patterns’s classic forced continuity complaints, and it’s also a roach motel, in that it’s deceptively simple to sign up for a Premium service on Doostang, but it’s a real bear to get out of one. Amtrak, like many other common carrier transportation companies, offers the user the option to purchase travel insurance. However, the option is just that, an option. While the questions about buying travel insurance are set off in a different-colored box, and you must pass through this screen and make a decision before you can pay for your ticket, Amtrak doesn’t choose either travel insurance option for you. Instead, you are required to decide, one way or the other. 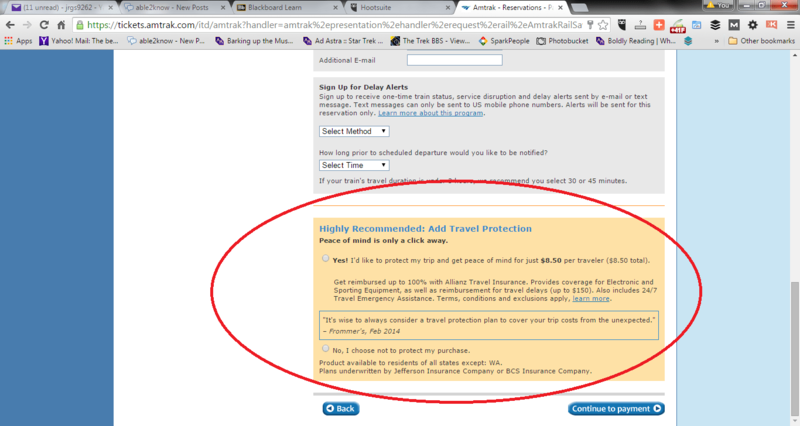 There’s no question that Amtrak is trying to make the buying of travel insurance seem like a smart thing to do. But the consumer isn’t beaten over the head with numerous dubious reasons to make the purchase, and the screen is easy to understand. Doostang has two jobs to do, possibly three. Eliminate the preselection of anything on the sign-up page, or default to the free option. Clearly explain why a job seeker would want a Premium option. End forced continuity. Make it easy to cancel an accidentally added Premium service by adding online cancellation options and lengthening the time a consumer has before a full refund is no longer permitted. Close the roach motel. (Optional) Add more free services. Currently, Doostang only allows for applying to one job under the free service. This is the job connected to the referring URL. What if the free service was expanded, say, to that entire session, or for three job applications? A consumer just surfing in from a referral URL would never pay and, perhaps, would be served more advertisements. But someone clicking around, applying to a few jobs or opening up a long session would be using more valuable materials. Complaints of not knowing they were signing up for a paid service would have a lot less credence. Come to the light, Doostang! It’s not too late!